Beyond the listing itself, buyers have much to consider when choosing the place they’ll call home: access to good schools and hospitals, proximity to their job and other important places, and the availability of amenities such as restaurants, shopping and entertainment. But according to the National Association of Realtors‘ (NAR) 2017 Community and Transportation Preference Survey, walkability, good public transit and short commutes are becoming more important to buyers across various generations. 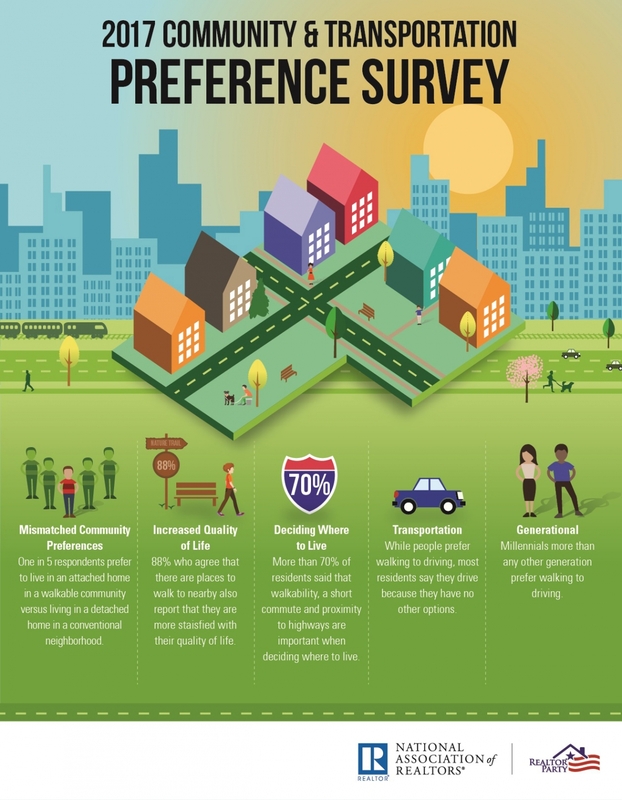 Although 60 percent of the 3,000 respondents said they currently live in a detached, single-family home, 21 percent of them would give that home up for a neighborhood with greater walkability — something that 51 percent of respondents said is important to their quality of life. Furthermore, 17 percent of survey takers said they’d be willing to spend “a lot more” to live within walking distance of parks, shops and restaurants. Another 43 percent said they’d spent “a little more” for the same thing. Fifty-five percent of the silent generation (72 years-old and over) said they prefer walkable communities and short commutes, even if it means living in an apartment or townhome. Gen-Xers and baby boomers still prefer the suburban life (55 percent), saying they’d deal with a longer commute if it means they could have a detached, single-family home. When it comes to gender demographics, young women prioritize walkability (54 percent) and access to public transit (39 percent) more than their male counterparts, no matter the age. Forty-one percent of respondents with incomes below $50,000 said walkability and access to public transit was a “very important” factor in deciding where to live, compared to only 27 percent of respondents making more than $100,000 who said the same thing. Sixty-percent of respondents with school-aged children favored a less walkable suburban community over a more walkable urban community. They said large single-family homes with large yards were important for their children — something that isn’t found in most urban communities. Millennials (49 percent), people of color (48 percent), downtown dwellers (61 percent) and those without cars (61 percent) said they like taking public transit. Meanwhile, the silent generation (71 percent), respondents making $150,000-200,000 (74 percent) and those living in rural areas (72 percent) tend to drive. Seventy-three percent of respondents said maintaining and repairing roads and bridges should be a “high priority” for the government, and 54 percent said alleviating traffic congestion should be the “next highest” priority. The survey of 3,000 adult Americans living in the 50 largest metropolitan areas was conducted by American Strategies and Meyers Research in September 2017. The survey was conducted by YouGov on September 5-20, 2017. YouGov interviewed 3,210 respondents who were then matched down to a sample of 3,000 to produce the final data set. The respondents were matched to a sampling frame of the top 50 metropolitan statistical areas (MSAs) on gender, age, race, education, ideology and political interest. How does demand for walkable cities fluctuate?